You are currently browsing the tag archive for the ‘tf2 sniper achievement’ tag. Well it seems that we were very wrong. We assumed that Valve had tricked us by making us believe it was the Sniper update when it was really the Spy update. Apparently we’re going to get the Sniper AND the Spy update tomorrow. So we’ve now seen all of the Spy gear and today bring the last of the Sniper gear. Recapping the Spy’s gear, we know that he’ll recieve The “Dead Ringer” Spy Watch, The “Cloak and Dagger” Spy Watch and The Ambassador. The Sniper is going to recieve The Huntsman, The Razorback and now The Jarate. The Jarate was todays release for the Sniper. One of the most disturbing items so far in TF2, the Jarate will extinguish flame, pull enemy Spies out of cloak and cause enemies to take 35% more damage. Valve seems to have taken some inspiration for the Sniper update from MMORPG’s. He’ll get a bow, a shield and an item that makes people take more damage. That sounds a lot like an MMORPG to me. Regardless we’ll see how this all plays out. Team Fortress 2: Spy Update; Day 6! Today should be the day that the update is coming, but for some reason Valve has decided to push it back until Thursday. Either the patch just isn’t ready or they’ve got a lot more content they are going to be bringing out with this update. It could also be that they gave two days of a fake Sniper update and they’re making it up by adding two more days before the release. Regardless the patch should be here on Thursday. Today brings the release of The Ambassador. This is going to be the Spies new revolver and second hand man in a fight. Anyone who’s ever attempted to backstab someone who’s turning around knows that the revolver is a great way to finish the job. Not only does this thing look pretty it’s also highly lethal. It doesn’t say “Put two wheels on this thing and it’s a cannon” for nothing. With this much firepower it’s going to most likely have a pretty big cool down. What I wouldn’t be surprised about is if you can get a headshot / instant kill with this puppy. The description says that it has the accuracy of a sniper rifle. I’m willing to bet the amount of power it’s packing you’ll be able to remove your enemies head from his spine. Don’t forget to check out our two new TF2 Guides; TF2 Achievement Guide and TF2 Class Guide. If you get the achievement guide today you’ll get the Spy content a few hours after the release of the patch. Today brings a sad and yet funny day. Valve intended on releasing their Meet the Spy video today as the official Spy Update of the day before its release tomorrow. Sadly someone from their department failed to make the video private and waiting sharks snagged it up. So Meet the Spy was leaked on Saturday but today is it’s official release. So in honor of its release we shall post it again for your viewing enjoyment. The video was not the only thing released today though. 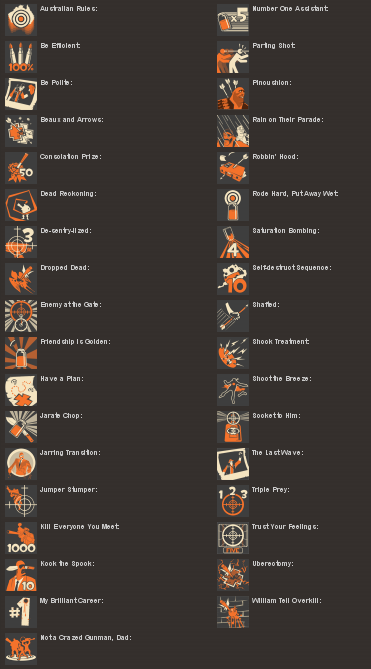 They have officially released the icons and names of the achievements for the Spy. Don’t forget to check in tomorrow as we will be updating our LiTi-4 Weapon Unlock Achievement Guide. We’ll have a guide to get all the weapons for the Spy tomorrow. Hold on to your hats! The Team Fortress 2: Sniper update was really the Team Fortress 2: Spy update all along! All of us were fooled by Valves amazing disguise. While lots of people were suspicious of the weapons the Sniper was going to get not many saw this one coming. While giving the Sniper a bow and arrow does seem a bit strange, the shield didn’t. For anyone that had their doubts about the bow had their minds changed when the shield was released. Regardless today is the day we will be seeing what amazing things they’ll be giving the Spy. Two new watches have been added to the Spies collection of gadgets. The “Dead Ringer” Spy Watch sounds like it will drop a rag doll on the floor making it appear that you’ve been killed. Really you were instantly cloaked for eight seconds; just long enough to back stab the sucker. The “Cloak and Dagger” Spy Watch is your new cloaking watch that can allow you to stay invisible permanently. The catch to this watch is that you can’t pick up metal to replenish your cloak but if you stand still you can regenerate your cloak over time. I think these two new gadgets are going to make the Spy even more of a pain than he was before. *For patch notes look at Team Fortress 2: Sniper/Spy Update Notes . A post explaining the new system check Team Fortress 2: New Unlock System. Today is the third day of the Sniper update. We all knew it was coming we just weren’t sure in what form. The Sniper has been given a major tool against those Spies who just love to backstab unsuspecting Snipers. Meet The Razorback. This shield is good for one save from a backstab. Unfortunantly for the Spy if they do stab you with this equipped they’ll be jolted with electricity. The stab will not only destroy the shield but it will also make the Spy wait before he can take another stab at the Sniper; giving the Sniper time to react. Watch your back or don’t! Now it’s YOUR choice. The Razorback is a beautiful hand-carved tribal shield, built using indigenous techniques passed from father to son since before recorded time. Sometimes the old ways really are the best ways. And after using the Razorback in the field, we quickly discovered this was not one of those times. Today is Day 2 of the Sniper update for Team Fortress 2. They released two new maps for the game as well as a new game mode. Payload Race is going to be the new game mode for TF2. Basically it’s the same as the previous payload system except both teams will be pushing a cart. I can’t wait to play it. The day we’ve all been waiting on is finally upon us! Team Fortress 2: Sniper Update has officially started. Just like all the previous class updates this one will be broken down into seven days. Next Tuesday will be the official release of the TF2 Sniper Update. Day 1 describes the first weapon to be revealed. The Huntsman is a bow and arrow with 18 arrows and a one-second charge to full power. Headshots, like the sniper rifle, can give you an instant kill. “Any experienced sniper will tell you how irritating it is when your targets keep moving around. The question is how to stop these cheaters from wind-sprinting around like they own the place. And the answer is to pin them to a wall. How? With arrows! “Now, hold on,” you might be thinking. “I’m strong, but no one could throw an arrow that hard.” Introducing the Huntsman longbow, which solves that age-old throwing problem. “Now, hold on,” you keep saying. “Aren’t bows and arrows primitive and harmless?” Why don’t you ask the dinosaurs? Except you can’t, because the cavemen bow and arrowed them to death. One headshot from the Huntsman can mean an instant crit, in addition to a bolt-riddled corpse hanging from a wall that’s gruesome and funny.